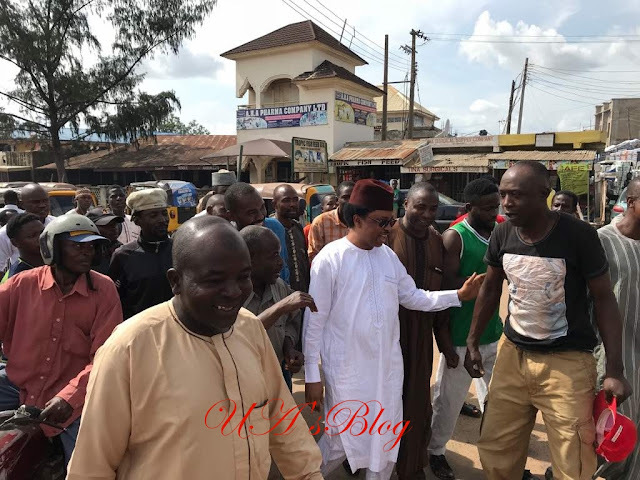 The Senator representing Kaduna Central, Comrade Shehu Sani, in Kaduna on Tuesday visited the central market popularly known as Sheikh Abubakar Gumi and interacted freely with traders and other citizens who were in the market to carry out their business activities. The Senator moved from one part of the market to the other, interacting with traders on the prices of their goods and other Nigerians who were in the market to carry out their normal business activities. Ujuayalogu'sBlog reports that the Senator was warmly received wherever he turned to as people kept praising him for identifying with the course of the common man in the discharge of his national activities in the Senate. Recall that governor El-Rufai had on Monday while addressing newsmen in Abuja dared Senator Shehu Sani to test his popularity by going to the central market, if he would go unhurt, accusing the lawmaker of working against the party, and that the people were not happy with him. But a trader, Mohammed Sani told DAILY POST, “Senator Shehu Sani remains one of the outstanding Senators in the country that has truly identified with his people and carried them along on anything that has to do with their welfare. “He, Shehu Sani is one of true Nigerians that will always stand for his people and defend their course not minding the repercussion. Mohammed Sani explained that the popularity and acceptance of Senator Shehu Sani could be seen in the way and manner people who were in the market ‘hailed’ him irrespective of tribe, religion, political affiliations or sectional difference. “It is only when we have politicians like Senator Shehu Sani who truly means well for the people that the country will feel the impact of the dividends of democracy. Shehu Sani has truly identified with his constituency throughout his tenure at the National Assembly and to me, he deserves another tenure as a Senator of Kaduna Central,” he observed. Other Nigerians who spoke to DAILY POST said they were pleased to see Senator Shehu Sani moving freely in the market, saying that it is an indication of his love for the common man and to see for himself the prices of goods in the market to be able to speak the minds of the common man at the National Assembly.